I have a confession to make. Even though I do love teaching group yoga classes, I’ve fallen quite in love with teaching private yoga sessions. This is fine, and wonderful, and I love teaching groups. But a 1x1 yoga session is vastly different from a group class. Over the past several years, I’ve taught several private sessions for students. But frankly, I didn’t really know what I was doing until I took Francesca Cervero’s course, The Science of the Private Lesson. I just treated them like a regular group class, not realizing what an impact a TRUE private session could have. In my private sessions with several students, and through what I’ve learned in this immersive course, my approach to privates has DRASTICALLY changed. So what IS the impact of a private yoga session? 1. The student gets to do whatever they want to do. In a group class, I’m largely teaching what I want to teach that day. What I think that perhaps 80% of the class will enjoy/benefit from/etc. Perhaps I’m teaching what I’ve been working on recently in my own practice or from my own teachers, and am then communicating this to students. But you know, I can only do so much. I can’t please everyone. On the other hand, in a private yoga session, the STUDENT decides what they want to do. I usually have some ideas for what I will work on with a private student. But when that student gets on their mat and tells me where their body and mind is that day, we adjust together and the work is dynamic that way. Brand new to yoga? Awesome, we baby-step into basics of breath, body, and mind. Working toward a particular pose? Great, they get to work specifically toward that over time. Have an injury that needs to be worked with? Wonderful, the practice can be tailored. The student doesn’t have to worry about figuring out modifications on their own with 15 other people in the room. 2. The practice happens within the context of real life. When you come to practice yoga at a studio, some of the aspects of calm and focus are taken care of for you. Really really nice, right? You walk through the doors of the studio. There might be nice music playing. It’s pretty quiet. It is clean and soothing. People are happy and nice (mostly). At home or in your office, this is not always the case. This might sound like a downside, but I actually see it as a huge benefit. 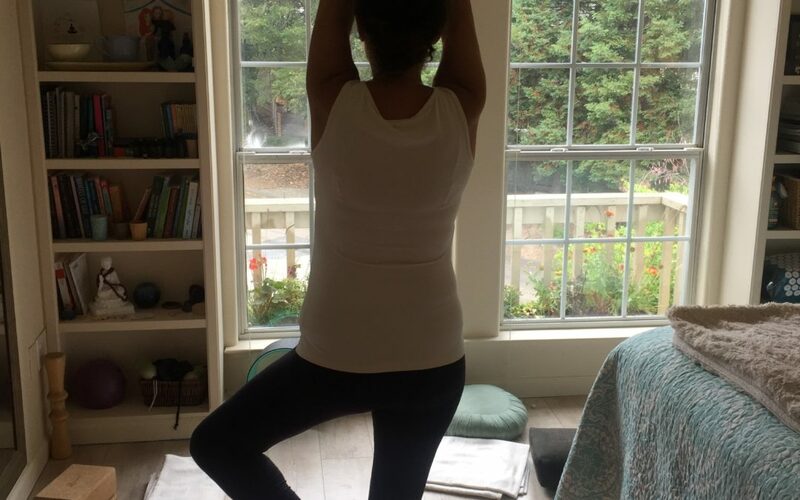 Suddenly, practicing yoga amidst the piles of laundry that need to be put away at home, or maybe right next to your desk in your office, or with the sounds of family and life going on around you helps you find calm IN YOUR LIFE. And isn’t that what we are trying to do? Take the work of yoga into life? If I can help my student find her breath on her mat, despite the dust bunnies around her, this is big. If I can help my student find calm and focus while her computer and to-do list are right there next to her on her desk at work, this is big. If I can help my student respond mindfully to her children in the middle of her practice, this is big. And hey, I try to make my home studio a very inviting, clean, and soothing environment so that the student feels welcome and at ease. But it’s still a HOME. And this experience of practicing at home or at work, where real life goes on, provides lessons that a studio practice just can’t. And I think that’s really important. 3. The practice HAPPENS because scheduling is in the student’s hands. Instead of fitting the practice into a class schedule, it’s just me and the student working out the time and place. Some students need to practice during lunchtime or in the evening after work, or even early morning. Some students have flexible work schedules, so we can do a mid-morning or mid-afternoon practice. When I come to their home or their office, suddenly the practice just happens. They are committed to that hour, and we make it happen together. In and out in an hour. And if things need to shift because life comes up, we do our best to shift and pick up the practice later in the week if our schedules allow it. I do have a strict 24-hour cancellation policy. Beyond that, there is a TON of flexibility around the way private yoga sessions fit in to life. I have conversations with my students around how to make it happen, and we do that. 4. The practice is a two-way conversation. Speaking of conversations, a 1x1 session is very much a conversation the whole way through. It’s not just me, talking to the student and trying to get some level of feedback by watching their body and breath, the way I do in a group class. And they get to RESPOND. The level of inquiry and curiously in their own body and breath that the student very quickly develops is pretty amazing. Instead of ME telling the student what they “should be feeling” or “might be feeling,” they get to dig around in their experience and tell me. And then the practice goes on from there, depending on how they feel. I just don’t think we can get to this level in most group classes because it can’t be this deep of a two-way conversation. And it’s so important. Then the way of experimenting with the body that the student gets can go into their experience in group classes, and they can continue to have that conversation with themselves. I think this is pretty cool. 5. The practice provides emotional and physical support and challenge. explore some mobility in new ways. And it’s not just physical. From an emotional perspective, sitting still in meditation or lying down in Savasana might be really challenging for some students. We go for a balance. Just enough challenge and just enough support. Because I’ve really learned to work with private yoga students in this 1x1 capacity, I have grown a TON as a yoga teacher. In my group classes, I am more able to see my students in a different light and to get to know them more intimately. If one of my private students comes to my group class, because of our history of working together privately, I’m more able to help them in the collective practice. I can remind them of things we’re working on privately. I can encourage them to bring in this listening and attention to the group class. If something is really effective for a private student, I can sometimes bring in similar work to a group class. And working privately with students has given me the capability to open up more of the two-way conversations when it’s possible, even in the group setting. As a result, as a teacher, I’m building awareness and inquiry and attention in a whole new way. THIS is the deeper practice of yoga. Curious if YOU could benefit from private yoga sessions? I offer session packages as well as single sessions in the Santa Cruz, California area. Please contact me to inquire as to availability. Simply email me at [email protected] and we’ll get you scheduled! Your body and mind will thank you. I don’t know how to begin explaining how unbelievably special and unique the experience of practicing yoga with Robin is like. Robin is a SENSATIONAL yoga instructor. I passionately look forward to our weekly private practice because I truly feel transformed. The most special attribute of a private session is how Robin works with how your body is feeling that day or specific requests to strengthen certain areas of your body. Her knowledge of the human body, yoga poses that effect specific areas, as well as your level in the practice are all accounted for so you never feel like you can’t do it. In fact, sometimes you surprise yourself. I’m both physically and mentally challenged each session with new found strength and realizing a better part of myself emerging each time. My hope is that anyone who wants to feel better physically and mentally should try yoga, ESPECIALLY with a teacher/ instructor as experienced and intuitive as Robin. I think yoga is an incredible foundation to have and add to anything physical we do. It’s one of the most powerful healing activities on the planet. Thanks to Robin, I feel like I can give more of myself to the life surrounding me. I just love it…And Robin!! I’ve been practicing yoga for 10 years and have ALWAYS struggled with the pressure put on my wrists in the poses. Many teachers have offered suggestions for keeping wrists healthy in those poses, but not until I started taking Robin Penney’s classes did my body really learn how to do it. If you are a yogi or yogini in Santa Cruz, I highly recommend doing a private session (or a few, or regularly!) with Robin. It was like physical therapy and a massage and yoga all rolled into one and super personalized just for me. Well worth it. Thank you Robin for such a lovely time working 1-on-1 with you. As many of my friends know, I appreciate what Yoga does for the body but, I don’t do well in classes and easily get bored or distracted. No judgment… just the way I am. I have learned that what works for me is practicing alone at home, so the 1-on-1 was perfect. Robin was so patient with my clumsiness and chattiness. I am excited to practice getting into some of those poses, like Crow, with her extra tips and advice. She helped me identify some of the nuances that I need to pay attention to… and props to help me get there without breaking my nose. So THANK YOU!! If any of my local friends are looking for some personal Yoga instruction, geared towards your needs, in an easy-going comfortable setting, I highly recommend you give her a call. For my non-local friends, you may want to check our her online instruction too. If Robin could get me to love it and focus, then she can help anyone.